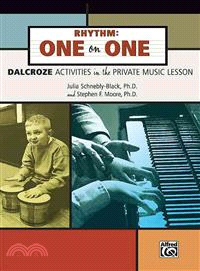 Dalcroze exercises are lessons of thrilling music improvisation. Teachers who experience Dalcroze Eurhythmics at workshops become motivated to share the experience with their students but are often unsure how to translate Dalcroze priniciples from group work into one-on-one activities. The authors saw this genuine need and wrote Rhythm: One on One to answer the question: "How do I use Eurhythmics with only one?"